Mountain Empire senior Sammy Jones goes for the contact on Tuesday. CAMPO (4-10-2019) – Mountain Empire High starting pitcher Trevor Elliott posted a big day. Not only did he fire three innings of shutout ball to gain the victory, he also clouted a home run to take an easy 14-3 Citrus League opener over visiting Calvary Christian of Chula Vista. Because the score reached 10-0 through three frames, Elliott received the win due to the CIF Winning With Integrity initiative. Normally, a pitcher need to last at least four innings. Elliott, the leadoff batter, hit his homer to center field in the 4th, also bringing home Sean Hodge (reached on dropped third strike) to make it 12-0. Elliott also doubled in a 3-for-4 effort, scoring four times to down the Purple Knights. The homer was his first of the season. Mountain Empire (7-4 overall, 1-0 Citrus) also saw shortstop Jacobe Noland bat 3-for-4, with 4 RBI and 3 runs. Included was a 2-run double to make it 5-0 in the 2nd. A.J. Schachner got his first hit of the season, driving in a run. He was awarded the game ball. Noland also came in pitch in relief of Elliott, followed by Ian Estrada and Sam Jones (3-for-4, 3 RBI) from out of the bullpen, combining on a 1-hitter. Calvary Christian (6-3, 0-2 league) opened with a misleading 6-3 record entering the contest; three wins were by forfeit. The lone hit was a line single to center with one out in the 6th. DEL NORTE 5, EL CAPITAN 1: At 4-S Ranch, this loss by the Vaqueros definitely hindered their playoff prospects. Fighting to return to the Top 12 in the CIFSDS Division II power index, they fell to a ballclub lower than them in the index in Tuesday’s (Apr. 9) non-league setback. El Capitan took a brief 1-0 lead in the 2nd, but it would be the lone run allowed by Nighthawks pitcher Logan Parker, who pitched into the 7th inning to gain the victory. The Vaqueros loaded the bases in the 7th, bringing the potential game-tying run to the plat, but Del Norte reliever Tyler Gibbons registered the final two outs for the save. El Capitan (5-11 overall) scored its run when cleanup hitter Jake Bergherm (2-for-3) stroked a booming, line double to right field, coming around on consecutive ground balls by Wes Buckner and Charles Rodriguez (RBI). 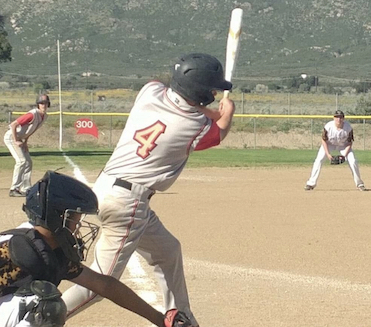 For Del Norte (5-11), Parker struck out five Vaqueros, while seven different players hit singles. CATHEDRAL CATHOLIC 11, CHRISTIAN 6: At Mitchell Field, the Patriots are definitely undermanned against Western League foes, dropping their seventh straight league contest in falling to the Dons in Tuesday’s (Apr. 9) opener of a home-and-home series. The Dons opened by scoring seven times (two earned) in the 1st, mounting a 9-0 lead before Christian could answer. Cathedral Catholic (9-8 overall, 4-1 Western) No. 9 hitter Zach Torres was the lone Dons ballplayer with multiple RBI with two, while only a pair of Dons — leadoff batter Nick Guerena and first baseman Nico Ryder — had two hits. For Christian (6-13, 0-7 league), Trace Ramos was the lone Patriot with 2 RBI. Two hits each were registered by catcher Matt Souza and second baseman Fisher Ransom. For Ransom, both were leadoff singles in the 2nd and 4th, scoring both times. on hits by Sousa, including a double to left-center in the 4th. “We imploded in the first inning but battled back to make it a game,” Christian High head coach Mike Mitchell said. “Every team has one of ‘those’ innings during the year where balls are not crushed but just not hit at you defensively. Then when they do hit it at you, we drop it or throw it away. The Patriots committed three errors. “I think we were just a little too nervous early,” Mitchell said. “Cathedral is traditionally such a good team, we might have psyched ourselves out. “They pressured us early and we did not respond very well. Jared Eichorst pitched four innings in relief for the Patriots. LIBERTY CHARTER 14, GOMPERS PREP 2 (6 inn.) The Lions won their Summit League opener in a run-rule decision after 6 1/2 innings and improved to 10-5-1 after El Cajon Valley snapped their nine-game winning streak last time out. Freshman Isaiah Hilke continued to rake, driving in four runs on a pair of hits and scoring three times, while senior Zachary Schwarz had three hits and drove in three. Senior Vicente Perez allowed five hits over six innings, striking out eight.